I tired out this recipe for dinner last night. It ‘s my first time cooking with capers since I found out what they were. They are in fact, not small fish like I thought. 😛 This chicken was really simple to make and really good. I will probably not put in quite as much lemon juice next time though. I doubled the pan sauce. I like sauce. Combine the pan sauce ingredients in a bowl and set aside. 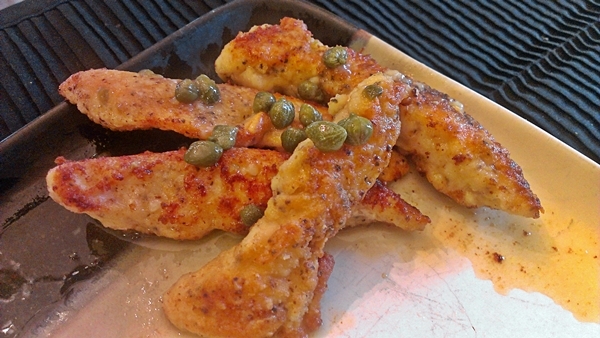 Season the chicken breasts on both sides with ample salt and pepper. Put a handful of flour in shallow dish. Dredge chicken in flour coating well. Heat 2 tablespoons of the butter and the oil in a large skillet over medium heat. Before adding the chicken, test the heat of the pan by flicking in a little of the dredging flour. If the flour sizzles enthusiastically and immediately turns golden, the pan is ready. Add the chicken and cook for about 4 minutes without moving the breasts. Then, turn them over and cook for another 3 or 4 minutes on the other side. Transfer the chicken to a plate and keep warm. Add the pan sauce ingredients to the hot pan and boil, stirring and scraping up the browned bits in the bottom of the pan. Add the remaining tablespoon of butter and whisk until smooth and glossy.Spoon the sauce over the chicken and serve immediately.